This collection of meditations will enchant you no matter what age you are. Everyone is so obsessed with youth nowadays that we seldom give thought to the later stages of our lives. If we do confront the inevitability of ageing, it is usually with fear or worse, disgust, not as something to look forward to. The vision of having to undergo repeated painful procedures to have his teeth replaced by implants instead of opting out for the quicker, simpler and cheaper solution of dentures sends Klein to the Greek island of Hydra where he explores the pleasures and advantages of old age. 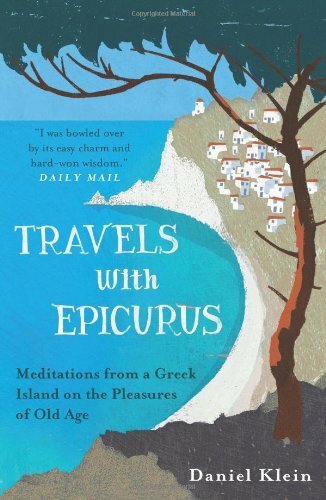 Through witty anecdotes involving elderly locals and reinterpretations of renowned thinkers from Epicurus to Camus, Klein shows that there is much more to old age than meets the eye. First published in the Cape Times on 31 October 2014. This entry was posted in What I've Read, What I've Written and tagged Albert Camus, Cape Times, Daniel Klein, Epicurus, Greek island, Hydra, Karina M. Szczurek, meditations, old age, Oneworld, Travels with Epicurus: Meditations from a Greek Island on the Pleasures of Old Age on November 4, 2014 by Karina.